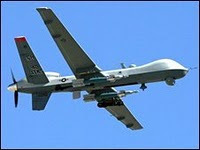 Washington University St. Louis School of Law was the site last week of a debate on on the legality and foreign policy implications of the United States' use of drones in the Afghanistan-Pakistan border regions, an issue about which we've posted frequently. Debating were IntLawGrrls guest/alumna Mary Ellen O'Connell (University of Notre Dame), who's posted on the issue here, and Kenneth Anderson (American University). Their spirited engagement at the Whitney R. Harris Institute, of which IntLawGrrl guest/alumna Leila Nadya Sadat is Director, can be watched on video here.